The Cavalier King Charles Spaniel – Noble Facts About this Regal Breed! Welcome to our fourth installment in our “all about dogs” breed series! This blog will be about the very majestic Cavalier King Charles Spaniel! With their sweet disposition and adorable big brown eyes, it’s easy to see why this breed has been captivating hearts since the 1500s. But few know about their long and storied histories! Here at Petland, we always have Cavalier puppies for sale! This breed loves nothing more than to cuddle with their beloved owners. Being bred as the consummate lap dog, they are widely known for their friendliness and affection. They bond with their owners very strongly, making it difficult for people that are away from home often to do well with this breed. Otherwise, this playful breed is perfect for families and children alike. The Cavalier started out as just a toy spaniel in the 16th and 17th century. Then after garnering the love of King Charles II, they were named after their most famous owner. Because King Charles was sometimes accused of neglecting the kingdom in favor of his beloved dogs, he was dubbed the “Cavalier King”. The name then stuck with the spaniel as well! 3. The Cavalier and the Pug. Wait, what? Once King Charles II passed away, the Cavalier went through a lull in popularity. Breeds like the Pug began to take its place in royal households and eventually they were bred together. Because of this unlikely pairing, the Cavalier then developed a shorter snot and domed head. These features live on today in both the Cavalier King Charles Spaniel and the offshoot breed the King Charles Spaniel. Cavalier King Charles Spaniels have four very distinct colors with very special names! The most popular is Blenheim, chestnut and white, that was named after the battle of the Blenheim where a famous breeder of the Cavalier fought. The other colors include King Charles (black and tan), Ruby (mahogany) and Prince Charles (tri-color). Even though the origins of the Cavalier date back centuries, the AKC only formally recognized the breed in 1995. Since then it has grown in popularity by leaps and bounds. The Cavalier was rated 18th in the country just last year and should continue to gain admiration. Despite being a spaniel, the AKC puts the Cavalier in the Toy Group in shows because of their diminutive size. We hope you enjoyed this little bit of background into the awesome breed that is the Cavalier! 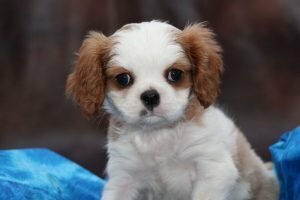 Because the Cavalier is so popular, we try to have this breed in our store at all times, check out available puppies to see Cavalier puppies for sale! The Cavalier King Charles Spaniel is such a great breed for so many different types of people and our Pet Counselors have no problem letting you know if this breed is best for you. We encourage our customers to play and interact with our puppies before they make the big decision to take them home. So stop by today if you think a Cavalier might be a great addition to your family! Want to know more about the breed? Check out our breed info page! The Golden Retriever – Friendly Facts About America’s Cuddliest Breed! We hope you’ll enjoy this next installment of our breed series blog! It’s no mystery why the Golden Retriever is so popular. The well-mannered, fun-loving dogs are a hit with children and adults alike. The Golden Retriever is the 3rd favorite dog in America, only after the Labrador Retriever and The German Shepherd. Here at Petland, we always have Golden Retrievers for sale! Check out these facts to enhance your breed knowledge on man’s best friend! Golden Retrievers truly have very highborn roots, being the creation of Dudley Coutts Marjoribanks, 1st Baron Tweedmouth, aka the Lord Tweedmouth. Lord Tweedmouth began shaping this noble dog in his native Scotland by breeding flat-coated retrievers with the Tweed water spaniels. 2. Do You Smell That? Golden Retrievers Can! As evident by their apt names, Golden Retrievers were primarily intended to be a hunting dogs. They also possess a “soft mouth”, which allows them to retrieve delicate game without damaging it. Because of this selective breeding, the Golden has one of the best sniffers in the game. They are also employed as bomb sniffers and search and rescue dogs as much as hunting companions these days! 3. The Golden Retriever Gets an “A”! Golden Retrievers aren’t just for looks, no sir! This family-friendly breed also possesses an exceptionally keen mind as well. They are listed as the 4th smartest dog breed, trailing only Border Collies, Poodles and German Shepherds. Click above for our blog on the best puppy breeds for families! 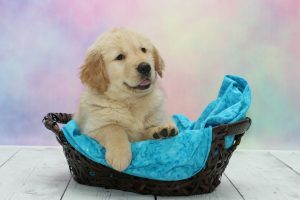 The AKC has always touted the excellence of the Golden Retriever’s personality and physical prowess, but it actually took a while before they were officially recognized. While the breed was popular from the very beginning, around the late 1800s, it wasn’t until 1925 that they graced the AKC with their very furry presence. The American Kennel Club introduced its official obedience trials in 1977, and its first three obedience champions were golden retrievers. The very first was a female named Moreland’s Golden Tonka, aka Tonka. During Tonka’s career, she earned eight perfect scores and 176 “High in Trial” awards. 6. And This is Where a Golden Retriever Really Shines! Although the originators of this breed might not have had anything but an excellent hunting dog in mind, the Golden has shown that their fierce intelligence and loyal countenance has a much different application these days. Golden retrievers are the perfect assistant dogs for people with various disabilities. Assistance-dog organizations like Assistance Dog International, Canine Companions for Independence and Paws With a Cause all train golden retrievers, Labrador retrievers and Lab-golden crosses for the job almost exclusively. We know more than most about the impressive skill Golden Retrievers have with helping people with disabilities. Petland Kennesaw has donated two Goldens as service dogs to families in need. We have also raised money for two charities devoted to training service dogs for assistance with disabled veterans. Because it’s such an intelligent and regal breed, we are proud to do this breed blog on the Golden! And because of the popularity on adding this breed into American households, we always find that our Golden Retriever puppies go fast! So don’t miss out and check our available puppies page for our Golden Retrievers for sale today! Want to know more about the Golden Retriever, because we do? Check out our breed info page! The Yorkshire Terrier – Interesting Facts About this Tiny Breed! The Yorkshire Terrier is the 6th favorite breed in America and for good reason! These pint-sized pups are as feisty as they are lovable and they have a very interesting past. Read along as we increase your breed knowledge with these fun facts about the Yorkshire Terrier! Here at Petland, we always have Yorkie puppies for sale! Even though the Yorkie is not a particularly old breed, these teeny dogs were one of the AKC’S original breeds. Yorkshire terriers became registered in 1885 along with a few other favorites like the basset hound, beagle and bull terrier. While today the Yorkie is popular as a companion breed, they started out originally in the 1800s as being effective ratters. Over the years, the Yorkshire Terrier breed has became slightly smaller, but no less tenacious! We think the Yorkie still retains that innate feistiness that made them great exterminators. Yorkshire Terriers descend from several similar terrier breeds, some of which no longer exist, such as the Black-and-Tan Terrier. But the one dog considered the father of the breed was a champion show dog named Huddersfield Ben. He lived only six years, but won more than 70 prizes and sired many Yorkies, laying the foundation for the breed. When the breed was in its infancy, the Yorkshire Terrier was called the Broken Haired Scotch Terrier, Broken Haired Toy Terrier or simply Toy Terrier. It was around the 1870s before the name Yorkshire Terrier was adopted to regard the place where the breed began. An America soldier fighting in the Pacific during World War II found a Yorkshire Terrier puppy lost in a foxhole. He named her Smoky, and she went on to become an American war hero. At first, Smoky visited injured American soldiers, making her one of the first therapy dogs. She later advanced to even more tactical work, stringing communication lines between outposts in the Philippines. Yorkies are part of the non-shedding group, so they rely on their owners for grooming. Their hair is similar to a person’s and it will continue to grow, sometimes up to two feet long! And while show dogs will have the much longer, breed-specific cut, most owners keep their Yorkies in a “puppy cut” to keep from having the daunting task of brushing out the coat several times a day. If you have ever been around a Yorkie, you know that their bravery and boldness know no bounds! They may be small (unbeknownst to them, of course), but they have the countenance of a large breed dog and will protect their owners at all costs. Last year, a 6-pound Yorkie in New Jersey even chased off a hungry bear that wandered into the dog’s home and threatened its owner! Because the Yorkie is so popular (and has been for many years! ), we try to have this breed in our store at all times, all you have to do is check our available puppies page to see our Yorkie puppies for sale! Want to know more about the Yorkie? Check out our breed info page! The Yorkshire Terrier is such a great breed for so many different types of people and our Pet Counselors have no problem letting you know if this breed is best for you. We encourage our customers to play and interact with our puppies before they make the big decision to take them home. 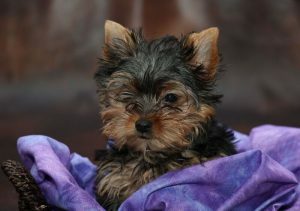 So stop by today if you think yorkie puppies for sale might be a great addition to your family! The French Bulldog – Charming Facts About this Charming Breed! As anyone who’s been in our store knows, we have a special affinity for a snorty, drooly and fat-faced little breed of dog called the French Bulldog! Even if you don’t frequent our store, it’s impossible not to have seen this quirky little breed in the tabloids beside their famous owners like Lady Gaga, Hugh Jackman and Leonardo DiCaprio or on advertisements like the famous Target commercials a few years ago. Here at Petland, we have French Bulldog puppies for sale! So you might be familiar with what the breed look likes, but this blog will help you explore the origins and personalities of this very interesting breed. This will be one of the first blogs in a series that really delve into America’s favorite breeds and how they came to be that way. We hope you enjoy! French bulldogs have a bit of a murky past, but most can find their roots back in jolly old England! English lace makers were drawn to the smaller version of the English bulldog as they would often use them as very effective lap warmers. The lace industry eventually moved to France and the ladies brought their beloved lap dogs with them. It is believed that there in France, the English bulldogs were most likely crossed with terriers to create the bouledogues français, or French bulldogs. The Frenchie is a very affectionate and friendly dog that was bred to be a companion to their owner. That puts them squarely in the “Non-sporting” category at dog shows, but we don’t mind that their only function tends to be staring at us adoringly. They are also a quiet breed when it comes to barking, but they do “talk” to their owners by using a complex system of yawns, yips, and gargles. Frenchies are a little show to train, but the effectiveness of treats should help you overcome any problems! The French bulldog doesn’t need much exercise and does very well in a crate. Frenchies tend to be very sensitive, so they do not take to harsh criticism lightly. If you scold a Frenchie, odds are it will take it very seriously and mope around the house. French bulldogs respond better to positive reinforcement (especially with treats!) and lots of encouragement. 5. Did You Know That Most French Bulldogs Are Born Through Artificial Insemination? Frenchies have very unusual proportions and because of that, they can have all sorts of problems breeding. As a result, most French bulldogs are created through artificial insemination. While this measure makes each litter of pups more expensive, it also allows breeders to check for potential problems during the process. French bulldogs often undergo a C-section to ensure the momma will not be stressed and to prevent health complications. French Bulldogs are a brachycephalic breed, meaning they have shorter snouts than other dogs. These smushy faces, while insanely cute, make them especially sensitive to heat. This facial structure can also cause snoring, snorting and general loud breathing, but don’t worry, it grows on you! No French bulldog has ever won Best in Show at the Westminster Kennel Club Dog Show, yet the world’s biggest canine event has seen successful Frenchies. Ch. Bouquet Nouvelle Ami won the French bulldog Best of Breed title for eight years in a row in the 1950s. The streak ended only when Ch. Bouquet Nouvelle Ami retired. Her owner, Amanda West, won the category for the next 10 years with other French bulldogs. We hope you thoroughly enjoyed this blog about French Bulldogs! While the breed had a few dips in popularity over the years, the breed is in the middle of an astonishing resurgence in popularity. It’s currently the 11th most popular breed in the U.S. according to the AKC’s statistics. That’s up from 14th place in 2012, 26th in 2008 and 54th in 2003. Don’t be surprised to see Frenchies move firmly into the top 10 next year. Here at Petland, the French Bulldog is not only one of our favorite breeds, but our customer’s favorite as well, which is why we always have Frenchie puppies available for you to look at and take home! We usually have a variety of colors, but if you’re looking for something more specific, you only have to ask one of our Pet Counselors to help you find the right pup for you! We also have everything you need for adding a new little French Bulldog to your family, so stop in today! Want to know more about our French Bulldogs for sale? 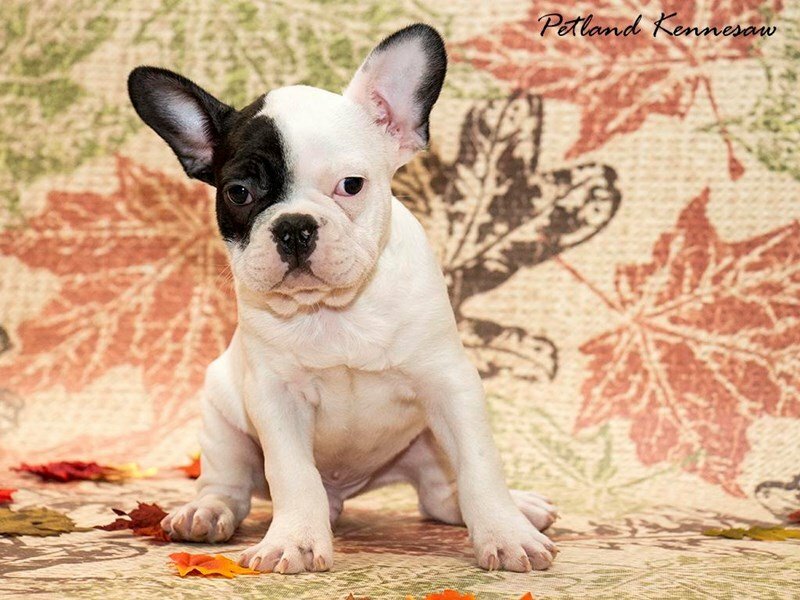 Check out our available puppies page to see all of our adorable French Bulldogs for sale!If you need to do more research, check out our breed info page!